Cracking good view of Atherton Tablelands and surrounding farmlands, with the tip of Walsh’s Pyramid in the distance. Mount Baldy peak is 1017m above sea level and the walk rises 320m over 2km to the summit point. The narrow path is quite obvious, but the rough rocky surface makes the climb strenuous. The climb up Mt Baldy is steep in sections, but the marked track and stone stairs is a favourite for fitness-loving locals who enjoy a quick view of Tinaroo Dam at the top before scampering back down. How to get there: Turn off the Atherton to Herberton road onto Rifle Range Road. Turn left at Newell Street at the gun club sign on the corner. The Mount Baldy car park and the start of the walk are 20m further along this road. It may sound like a miserable time but it’s certainly not – with a hike like this, there’s no time to feel anything but the buuuurn!. This hike takes about five hours return, which means you need to be up for a bit of sweat. Jumping over fallen trees, scrambling up boulders and steep inclines make this hike really exciting, and the views are so pristine, they make you feel like you’re on the set of Jurassic Park. How to get there: From Cairns, this is a 160km drive north to the Kulki day-use area at Cape Tribulation, including a ferry crossing (fee applies) – the drive will take about two hours. 250m north of the Kulki day-use area, there is a 'pull-off' area on the right that will accommodate 5/6 vehicles. The signposted start of the trail is directly opposite this. A rapid climb, spectacular views, sweeping sugar cane fields… it’s views like these that we’re certain inspired GangaJang lyrics. Not for the faint-hearted. this granite prism rises 922m to create a steep 6km return hike. Although a challenging climb, proudly standing on the peak with a view across the Wooroonooran National Park and beyond makes the jelly legs totally worth it. Human mountain goats can sign up for the annual ‘Great Pyramid Race’ in August, which tracks across Gordonvale, up the mountain and down again. 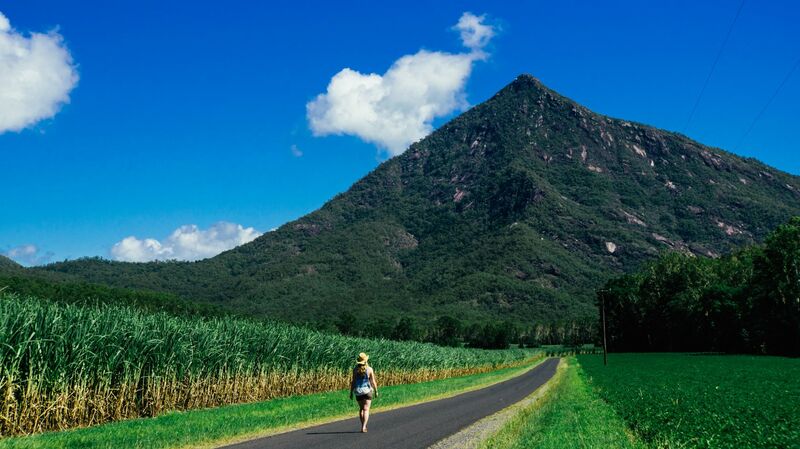 How to get there: Drive south of Cairns to Gordonvale along the Bruce Highway. Just south of Gordonvale you will cross a river. Turn right a few hundred metres after the bridge into Moss Road and follow to the carpark on your left. The Devil’s Thumb trail, just north of Mossman, is not for everyone. Although well marked, the trail has steep ascents and slippery surfaces and walkers must be prepared for rock scrambling in places. Only experienced bushwalkers with above average fitness should attempt this trail. At 10.6KM and 1020m elevation, give yourself 8 hours to complete. Highlights include the large coral fern patch and, of course, the summit itself. How to get there: The trail begins in the Whyanbeel Valley at Little Falls Creek about 17 km north of Mossman, which is 80 km north of Cairns along the Captain Cook Highway. Pass the Karnak Playhouse, then follow the signs to the start of the walking track. At 1622m above sea level, Bartle Frere is the highest point in Queensland and the second highest elevation gain in Australia, meaning this hike comes with some seriously good hiking cred and a sense of accomplishment. There are two main sections to the track, in the rainforest and above the rainforest in the boulder field. The rainforest section is wet muddy and steep and probably accounts for about 2/3 of the track. Expect to be on the trail anywhere from 6-8 hours to reach the summit, so make sure you plan well so you’re not depleted of daylight on your return journey. How to get there: Head south along the Bruce Highway away from Cairns until you come to Miriwinni. Turn off near here and follow the signs to the Josephine Falls National Park.